In April 1952 the northern New Castle County suburbs were flourishing as the post-World War era fueled the building of new housing developments. 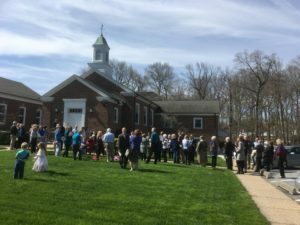 Recognizing the need to provide faith communities in this growing area, the New Castle Presbytery selected the Rev. Henry L. Jacobs to establish Concord Presbyterian Church. He made door-to-door visits in Fairfax and the surrounding communities, and in May 1952 the first regular church service was held in a former shoe repair store in the Fairfax Shopping Center. In July 1952 the Presbytery purchased the first manse on Waverly Road in Fairfax where the church school classes were held, later expanding into private homes in the community. 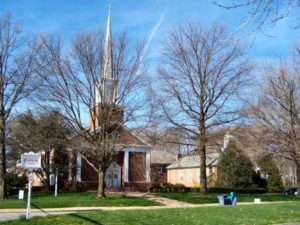 The Concord Presbyterian Church was officially organized at the 502nd meeting of the New Castle Presbytery on October 22, 1952, with 53 charter members. Since Henry Jacobs had been a draftsman before he entered the ministry, he drew the master plan for a proposed church building which was approved by the congregation in June 1954. The first building, the Chapel, was completed in January 1955 and the second unit, for office space and church school, was dedicated before the end of the year. Ground-breaking ceremonies for the new Sanctuary were held in 1957, and it was completed in the fall of 1958. During the summer of that year, Henry Jacobs carved the three-foot Celtic cross from solid cherry that became the focal point of the new Sanctuary. In 1969, the fourth unit (Fellowship Hall and class rooms), linking the other structures, was completed. Interim pastors have served between pastorates beginning with the transitional period following Tom Murphy. Concord also had Assistant or Associate Pastors from 1957 until 2002. Concord is currently in the process of actively seeking a permanent pastor [August 2018]. by providing a nurturing environment and activities for our children and youth, including the establishment of a kindergarten in 1956 that has evolved into Concord Preschool and Childcare. In 2018, the congregation completed an intense process of Spiritual Discernment to listen to God’s leading in all aspects of our life together. This became part of our Mission Study, a document to help us as we search for a new pastor. The study articulates a vision for the future, including efforts in the areas of worship, mission, spiritual formation, congregational life and congregational care. Our congregation is engaged in making these transformations real, and with God’s help, the new energy that is evident at Concord will ensure its continuation as a vital and growing witness to the Kingdom of God. You can read our mission study here.